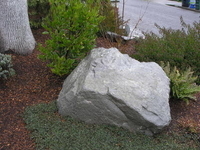 The gray granite boulders produced at our quarry have a subtle salt & pepper texture and make a striking contrast as accents in any landscape. 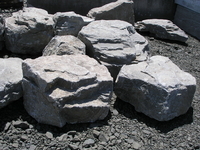 Irregular shaped boulders from 200 lbs to 10,000 lbs. We typically stock a good selection in the 300-3000 lb. 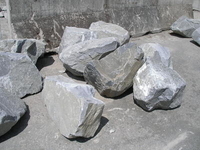 range at our stone yards. 160 lbs. 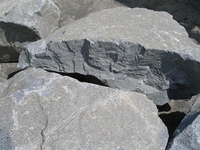 per cubic foot is the bulk density...a 2'x3' boulder will weigh between 1500 & 2500 lbs.